Evergreen perennial from a short, robust rhizome. 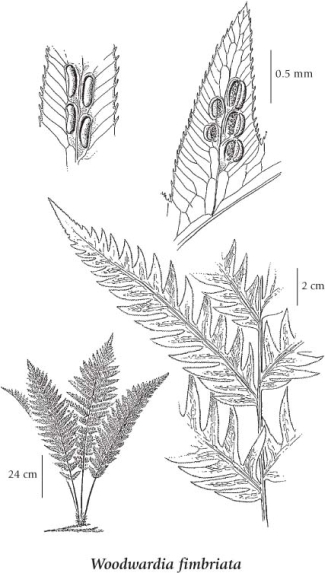 Numerous, upright or slightly bent back, broadly lanceolate, 40-170 cm long, 30-70 cm wide, 1-pinnate, segments deeply cut into pointed teeth with margins having many tiny spines. Wet forests and seepy, coastal cliffs in the lowland zone; infrequent in SW BC (SE Vancouver Island, Lasqueti and Texada Islands); S to CA, disjunct to AZ and NV.